After the two timelines of January (part I and part II), it’s time to publish the corresponding statistics: this month I have collected a total of 126 events. We definitely left the drop of December behind, and we are back at the same value recorded in November 2018. The Daily Trend of Events chart shows a sustained level of activity throughout the month, with two spikes on the 13th and 27th, and nearly no activity during the weekends. 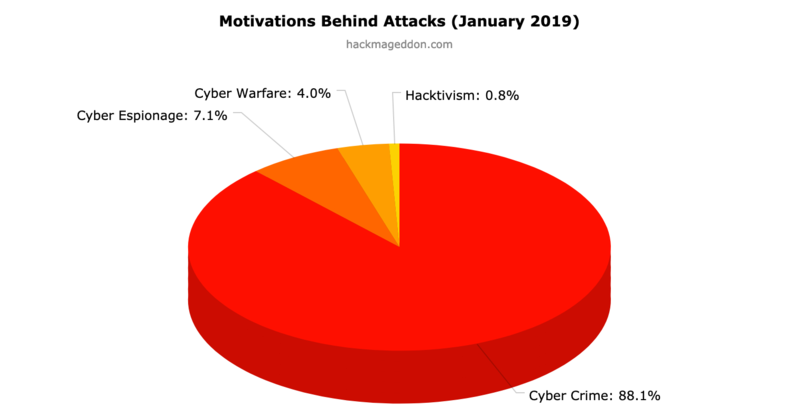 Ransomware and criptojackers keep malware on top of the Attack Vectors chart, with 34.1% from 25,5%. Account hijackings are stable at 24.6% (vs. 24.5% of December). Targeted attacks rank halve their percentage to 7.1% from 14.2%, and return behind unknown attack vectors. Something incredible happened in the Distribution of Targets chart: there are no governments (they were on top with 17.9% back in December). This month the chart is led by single individuals with 35.7% (it was 13.2% in December), ahead of multiple targets (11.1% vs 15.1%) and healthcare (9.5%). Keep on supporting the blog, and of course follow @paulsparrows on Twitter for the latest updates. Also feel free to submit remarkable incidents that in your opinion deserve to be included in the timelines (and charts).